The Dorchester Avenue Corridor is experiencing market pressures to change from its traditional manufacturing and industrial uses to residential and mixed-use. Situated just outside downtown Boston, between two major red line MBTA stations and bus hubs, it is a prime corridor for transit-oriented development. 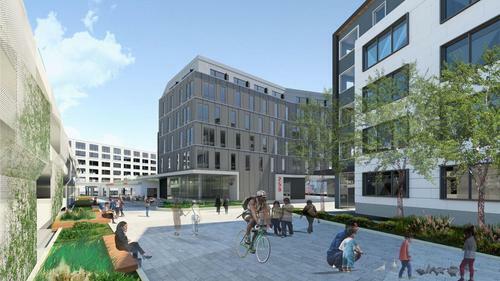 Dot Block is a proposed 475,000-square-foot mixed-use development near the juncture of Meeting House Hill, Jones Hill and Savin Hill. In short, the project will consist of mixed used development with approximately 430 units, 450 parking spaces and 72,000 gross square feet of retail. Dot Block could essentially create a new neighborhood spread throughout an entire city block. The project checks off many of the boxes that the city is looking for when it approves new development: it proposes improved access to retail and affordable, middle-income, and family-sized housing to meet local needs. It will deliver retail opportunities such as a grocery store to an area that wants and needs it, creating its own critical mass in a single project across a whole city block. Through open dialogue and community involvement, the BRA has examined several alternate development scenarios and their economic and physical impacts on the Dorchester Avenue Corridor and the surrounding South Boston neighborhood. The project is currently under review. If you would like to get involved, the next meeting is scheduled for Dec. 14th to discuss the current design plans. For more information about the meeting click here.